We had a fitful sleep due to a gurgling sound from gas tank that kept waking us up periodically the whole night. We checked it out a few times and no fuel was leaking. We saw an Emu family on our morning walk. Before we left, we picked up trash from careless camper’s fire pits. Driving along, we almost ran into a camel at the crest of a dune. Both of us thought it was a vehicle for a split second. 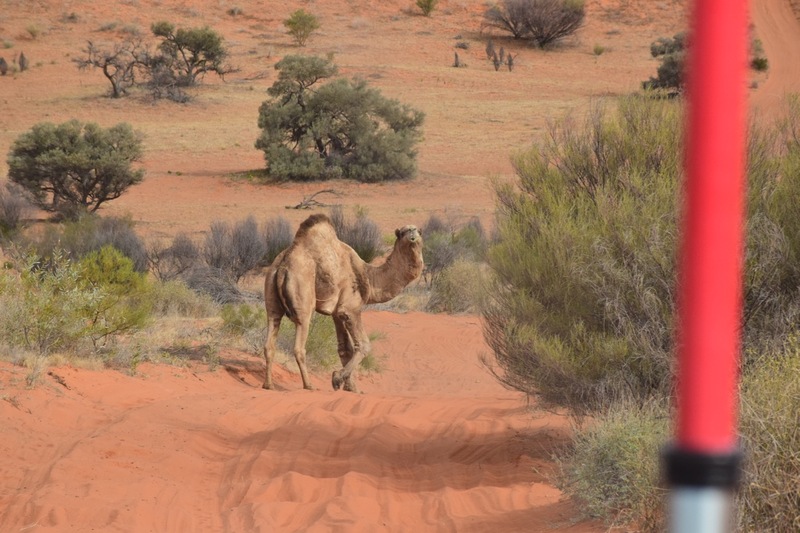 He walked/trotted/ran away from us along the track for a distance of two sand dunes. Saw our first Dingo from the truck. He was really skinny and was cleaning up a campsite. We can’t keep from saying “ate my baby” after every time we say Dingo. We met Barry and Robin who were traveling from west to east (the opposite way of us). They shared their experiences of crossing the Simpson over the years. Once, they did the traverse in a Kia (Sportage I think). People told them not to attempt it in that vehicle, but they did it – our kind of people! The four of us talked for a while until we had to get out of the way of some other vehicles that came along. Before we parted ways, they gave us some good tips on lonely tracks to traverse. Barry and Robin commented how they liked LeeWhay’s radio etiquette. LeeWhay was the darling of the Simpson with her “sing song American accent”. Quite a few people commented on it as we drove past. 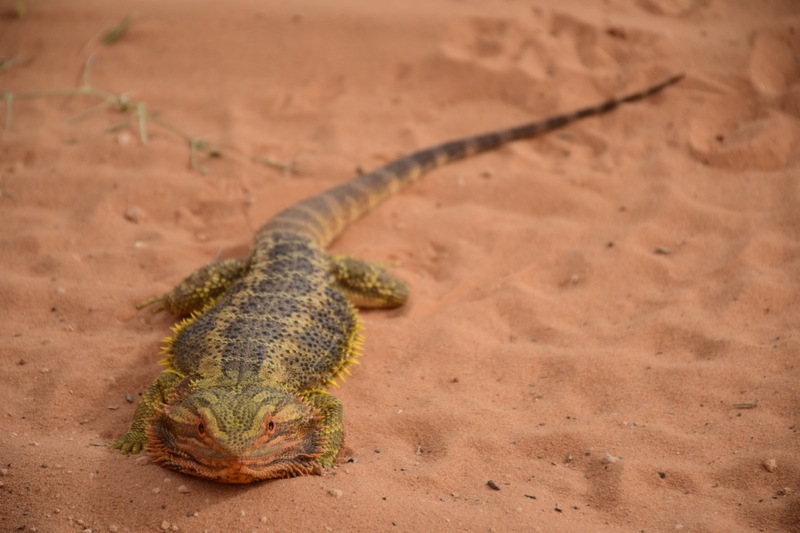 A bit north of Poeppel Corner, we almost ran over a Bearded Dragon. This guy was very docile. So much so, that he didn’t want to get out of the tracks even with a little prodding. At Poeppel Corner, three states come together – Queensland, South Australia, and the Northern Territories. Of course, I could not resist walking through three states in 10 seconds. This was a worthwhile place to eat lunch and to read the plaque. Some groups really wanted to engage us about our travels, our agenda, and the LX450 and Chaser. A few individuals would just step away from the group and look around the truck and trailer. It seemed as if these were the engineer/fabricator/mechanic types. Oftentimes, the Chaser suspension was of most interest to them. From Poeppel Corner, we turned south to head down the K1 track. It was a lonely afternoon drive. We saw no one else the rest of the day. After we made camp, we went on a bush walk. We were both surprised to see green parakeets all over the desert. They would fly really fast whooshing by us in a small flock as they travelled from tree to tree. For dinner, we cooked a simple, improvised lamb stew with what ingredients we had. Let’s just say the stew’s gravy was heavy on butter! For our desert dessert, we experienced one of Australia’s culinary delights for the first time: a “Tim-Tam Slam”. Thanks to our friend Tony who made us aware of this! Thanks! We’re slowly making progress on our writing… Stay tuned.